Hello friends. It's been a while, I know, but things have been crazy pants over in my neck of the woods. We are getting down to the wire with our house build - FINALLY. We are nearing the light at the end of this seemingly perpetual tunnel, and it is coming quickly. I went to the house today and there were approximately 10 trucks in the driveway and about 20 men working all over the house - painting and tiling and putting in closets. After a year of picking out the boring stuff like faucets and deck colors the fun stuff has begun! You would think that after four years of pinning home ideas on Pinterest I would know what I want to do as far as decorating our home is concerned. It is quite the contrary. I have too many ideas - way too many ideas - and I am having a hard time actually make a final decision on anything. I am losing sleep over rugs and window treatments. I spent probably about 5 hours (not joking) looking at rugs for Val's room, only to make a decision, and then change my mind again. I have nightmares about the wrong rugs being delivered. Ridiculous I know, but my life is all about the house now that the reality of actually living there is settling in. But right now I need your advice! The current thing I am losing sleep over is a coffee table. I know, madness, but we seriously can't make a decision. So I figured I would see what others thought about the four options we have narrowed it down to below. You do not need to know where they are from, or how much they cost, just simply look at the options in the collage and tell me which you think would work in the room. They are all relatively the same size (from 55" to 60" long) and very similar colors. All wood too. It is a big room, so it can hold a big coffee table, and the couch is huge so it needs a big table to anchor it in the room. 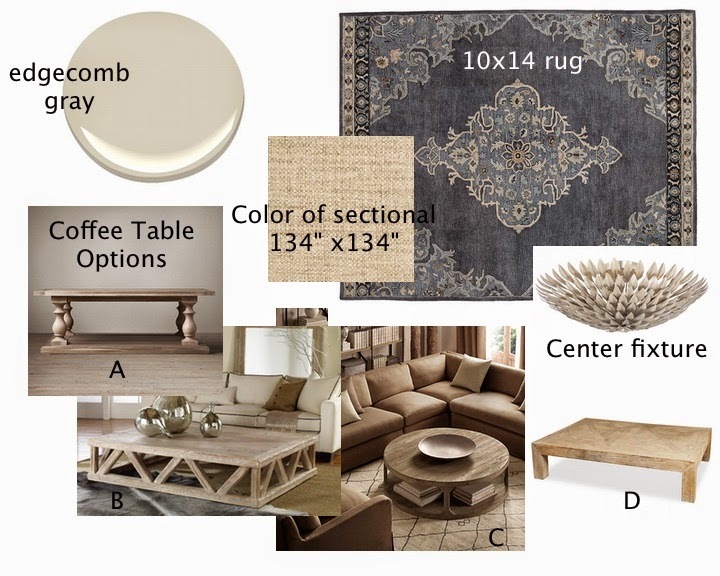 In the collage you will also see the paint color, Edgecomb Gray by Benjamin Moore, the rug (Pottery Barn), the color of the couch (it is almost tweedy looking up close) and the center light fixture that will go in the center square of a coffered ceiling. What are your thoughts??? Comment in the comment section!! I vote C - the round one. I may steal your wall color, as well!